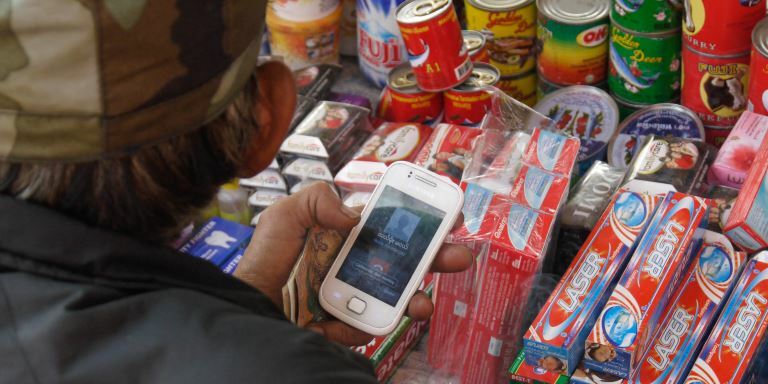 A merchant uses a smartphone to send money abroad. With mobile remittance solutions, many South Asians, particularly those from the rural areas, will be able to gain access to formal financial channels. Photo credit: Lester Ledesma/ADB. Economies in South Asia are heavily reliant on overseas workers' remittances, which comprise over three times higher than foreign direct investments, and ten times than official development assistances. The growing number of migrant workers brought remittance inflows to South Asia to a record high $72 billion in 2010. However, the figure only covers officially recorded figures: the total remittance, including those that pass through informal channels, is substantially greater, according to a working paper of the Asian Development Bank (ADB) published in May 2012. Despite the South Asian governments' efforts to increase remittances through formal channels, including a ban on informal agents, the informal remittance system remains the channel of choice for an estimated 40% of the population that is not served by banks. This poses a concern for South Asian governments and regulators as informal remittances fail to promote financial inclusion, but also become sources for smuggling, money laundering, and other illegal activities, the study said. ADB seeks to create an enabling environment for financial inclusion, and explore new technologies to expand access to financial services. Its projects focus on capturing a larger volume of the remittances in the formal financial system through the use of technology and financial innovations. Among the regions in Asia, South Asia is the second largest recipient of overseas workers' remittances in 2009, next to East Asia and Pacific. The formal remittance inflows to South Asia have been increasing from $16.13 billion in 2000, to $72.51 billion in 2010. An estimated 19.7 million people in South Asia work overseas as of 2011. Four countries—Bangladesh, India, Nepal, and Sri Lanka—sent out 1.8 million workers abroad and received remittances amounting to $73 billion in 2010. Remittances accounted for as much as 23% of gross domestic product in Nepal to 3.9% in India. An estimated 58% of these remittances go through formal channels such as banks and money transfer companies, while 42% are remitted through informal means, including friends, relatives, and agents (hawala, also known as hundi). While some governments in South Asia have already taken various measures to increase formal remittances, including a ban on informal agents, these have yet to result in a major shift to bank-based remittances. The use of formal remittance channels is often costlier than for urban populations due to the weak presence of formal financial institutions in rural areas. Informal channels thus appeal to unbanked populations also due to their relatively low cost, speed, accessibility, and customer friendliness. Some formal financial institutions in South Asia have started to offer mobile remittance solutions to reach the unbanked people. Bangladesh's BRAC Bank Limited partnered with United States-based Money in Motion and jointly launched "bKash," a mobile money service. The Bank of Kathmandu in Nepal has also linked up with Hello Paisa, an electronic money platform provider based in South Africa, to offer M-Paisa. Despite these initiatives, South Asians have yet to fully reap the benefits of remittances due to the lack of a more "e-money friendly" regulatory environment. Regulators remain cautious about mobile financial services and are slow in issuing licenses. Telecommunications infrastructure is also largely underdeveloped, making it costly for banks to develop their own agent networks. To reach the unbanked people, financial institutions in South Asia must explore the use of branchless banking and digital finance, such as the mobile remittance solutions offered by SMART Money in the Philippines. With access to 54 million subscribers nationwide, SMART Money users even from the street markets in Quiapo, Manila, are able to do cashless transactions on their mobile phones. Photo credit: Lester Ledesma/ADB. South Asian policy makers and regulators can look into the success of SMART Money in the Philippines for valuable lessons on addressing limited financial inclusion. Smart Communications (Smart), one of the dominant telcos in the Philippines, launched SMART Money in 2001 as a mobile financial service. With SMART Money, customers can use their mobiles to send and receive money domestically and internationally. Customers can cash in and out in branches and ATMs of Banco de Oro (BDO), Smart’s banking partner and e-money issuer; microfinance institutions (MFIs); pawnshops; and money changers that are widespread across the country. For international remittances, Smart has business ties with international banks directly or through its local commercial bank partners in countries with high concentrations of overseas Filipino workers (OFWs). In 2004, Smart launched SMART Padala (which means "to send"), enabling OFWs to remit directly to SMART Money account holders in the Philippines. By 2006, this service had a monthly average of 1.5 million users remitting $15 million. Mobile remittance solutions have the potential to increase formal remittances in South Asia and address the needs of the unbanked. The Philippines' experience with SMART Money offers valuable insights. The Bangko Sentral ng Pilipinas (BSP), the Philippines' central bank, allowed nonbank service providers, such as pawnshops and microfinance institutions, to perform cash in and/or cash out for banks. This enabled SMART Money to immediately expand its reach nationwide. The BSP also allowed simplified know-your-customer policies. Thus, a customer can open a SMART Money account by simply presenting a valid identification card at any SMART agent. Smart developed a wide network of agents throughout the country. Having pawnshops as agent, even customers in rural areas without bank accounts can use SMART Money. At the beginning, BSP allowed Smart to pilot test the product and discuss thoroughly with the central bank the benefits and risks of the system before the formal launch. This close cooperation with the regulator enabled Smart to come up with an effective product design. Smart also mounted an extensive multimedia campaign that featured animation, making people with limited financial literacy understand the product. Bringing informal remittances to formal channels. Instead of banning informal systems such as the hawala, South Asian countries must improve the level of transparency among informal channels to bring them closer to the formal financial sector. Improving formal financial systems. The formal financial sector must expand their network to reach out to the unbanked populations, and improve their competitiveness vis-à-vis informal remittances in terms of price, speed, and customer friendliness. Consumer education and protection. Regulators and formal financial institutions must raise the level of financial literacy among the poor and low-income populations to take full advantage of the benefits of technology-based remittance services. This article is adapted from the ADB Financial Inclusion Newsletter. M. Ozaki. 2012. Worker Migration and Remittances in South Asia. ADB South Asia Working Paper Series. No. 12. Manila: Asian Development Bank. Mayumi Ozaki is a financial sector specialist at ADB who covers a range of financial topics, including microfinance, financial inclusion, branchless banking, financial education, and banking sector reforms. Prior to joining ADB, she was an evaluation officer at the International Fund for Agricultural Development, in Rome, Italy. She has also worked in Bangladesh, India, Indonesia, the Maldives, Myanmar, Nepal, and Sri Lanka.